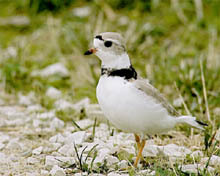 The federally endangered Piping Plover. Photo courtesy of Jack Bartholmai. The department issues permits, authorizations and licenses for research, education and other activities that involve rare, nongame and game species and habitats. Each has its own application requirements and procedures. Additional permits may be required by DNR programs or other agencies depending on the nature of the project or activity. Wisconsin's endangered species law allows the department to authorize the taking, exportation, transportation or possession of listed plant or animal species via an Endangered and Threatened Species Permit if the activity is for zoological, educational or scientific purposes, or for propagation in captivity for preservation purposes. *Having trouble viewing this form in your internet browser? Save it to your desktop by right-clicking the link and then choosing "Save target as..." or "Save link as..." Then open the desktop file by right-clicking the icon and selecting "Open with," and then choose Adobe Reader. You can also try opening the form in a different browser, like Internet Explorer. For Mac users: to right-click with a single button mouse, hold the control key while clicking. Falconry permits authorize qualified individuals to practice falconry in Wisconsin. To help provide you with better service, please read the information in the application procedures before contacting the permit coordinator with any remaining questions. After you are thoroughly acquainted with the sport and are familiar with Wisconsin’s falconry regulations, Chapter NR 18 [exit DNR], you are ready to apply for the required permit. Permit for non-Wisconsin resident falconers to trap wild birds in Wisconsin for falconry. A permit is required for collecting and scientific research on State Natural Areas. *Having trouble viewing this form in your internet browser? DNR fillable forms require IE10 or later to open and do not work with mobile devices. Try saving it to your desktop by right-clicking the link and then choosing "Save target as..." or "Save link as..." Then open the desktop file by right-clicking the icon and selecting "Open with," and then choose Adobe Reader. Mac users: right-click with a single button mouse, hold the control key while clicking. See DNR's Help with PDFs page for more options. An SCP authorizes collection or salvage from the wild, live fish and the nests and carcasses or parts of carcasses of any wild animals specified in the permit subject to the conditions and limitations specified in the permit and rules of the department. An SRL authorizes the holder to take from the wild, possess, kill, or propagate the species of all other live native wild animals that the department authorizes under the license. Both the SCP and SRL apply strictly to activities for education, study or research to increase knowledge. The SCP and SRL are NOT applicable to state or federally [exit DNR] listed threatened or endangered species. To help us provide you with better service, please read the information in these forms before contacting the permit coordinator with any remaining questions. Fish-related SCP submittals and questions. All other SCP and SRL submittals, questions or SRL fee payments. Note: Signed items may be scanned and submitted by email. A fee is required for SRL applications. Make checks out to: Wisconsin Department of Natural Resources and make sure the applicant’s name appears on the check. Mail checks to the address directly above. An SRL cannot be issued until payment is received. This application allows an individual to apply for a permit to collect seed from prairie and other natural communities on DNR land. Please read the DNR seed collecting guidelines [PDF] before printing and submitting your application.